Like in Supernatural, American fantasy horror series, Sam is getting better and stronger with every season, the same way Windows is also getting better and powerful with every new update. Every update, upgrade and the new operating system comes with new and amazing features. Windows 10 is the latest and most popular release from Microsoft that was launched back in 2015. Besides its new and attractive graphical interface, it has gone through some major improvements and offers lots of exciting features like Microsoft Edge, Cortana, personalized and updated Start Menu. However, there are many other hidden features and tricks that can easily help you to personalize your computer according to your preferences and needs. In this post, we’ve picked top 7 tips and tricks for Windows 10 that will give you faster Windows 10 experience. There’re many times when you forget to lock your computer especially when you’re in a meeting room with your boss, or out for a cup of coffee. But leaving your computer unlocked or unattended will be tempting for your coworker to peek into your machine or might play pranks on you. That’s where the dynamic lock feature of Windows 10 comes into play. So, your machine will be automatically locked when you are not around your computer. Step 1: Firstly, pair your smartphone with your computer via Bluetooth. Step 2: Head to “Start” menu and type “Settings”. Step 4: Choose “Sign-in” options. Step 5: Scroll down and look for “Dynamic Lock”, put a check-mark beside “Allow Windows to detect when you’re away and automatically lock the device. Now, your computer will be automatically locked when you are out with your phone and your computer is out of your Bluetooth range. We have been using third party software to record our computer screen or awesome highlights of a game but not anymore. Windows 10 allows you to record your gameplay video when you are playing your favorite games and clearing the difficulty levels in one go. To record anything on your PC, all you need to do is first start the game and then press WIN Key + G to open up the Windows 10 Game Bar now press WIN + ALT+ R and it will start recording your gameplay. • Open File Explorer from the task bar or press Windows Key + E together to open it. • Locate “Search Tools” from the top of the windows and click search ribbons. • Here you can scrutinize the search so that you get results as per your preferences. Note: Search results will differ as per the chosen preferences & options. There is a secret desktop button is available at the bottom right corner of your screen. Most of the people are not aware of a tiny silver button on the screen, next to date and time that will minimize all your open documents and windows to clear the desktop. Cortana is a digital voice assistant that comes along with Windows 10. It is quite similar to the Apple’s Siri feature. It let you search the content on the internet with your natural voice, which means you don’t need to type the information you want to search. Step 1: Go to start menu and click on the search button. 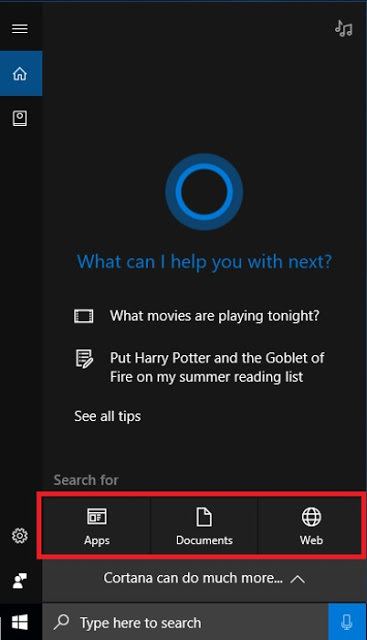 Step 2: Click on the mic button beside search box to activate Cortana. Step 3: Once Cortana is active, speak or type in the query to get results. Step 4: For more specific results, you can click on filters like Apps, Documents, and Web. 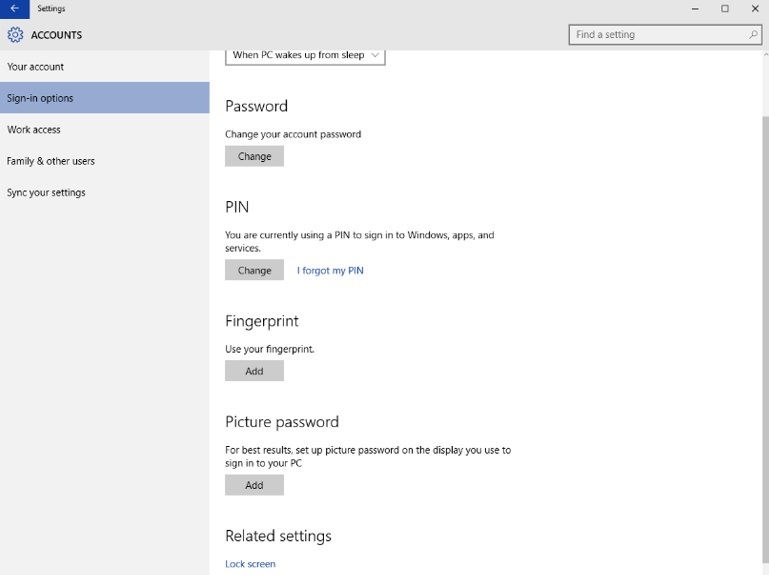 Windows 10 comes with multiple features and biometric security features id is one of them. It is a fantastic feature that enhances the security on your computer. You can enjoy face recognition feature when you have required hardware installed on your device. In order to activate this features, first, go to Start > Settings > Accounts > Sign-in options and set up your preferred way to lock your device. You can also read my another post on How to Unlock PC With Your Android Fingerprint Scanner. To open Settings with a mouse click is a bit time consuming especially when you are doing some important work. Moreover, using a mouse sometimes slow down your work speed as every time you need to reach out your mouse that takes few clicks to open Settings. However, using keyboard shortcuts will distress you from touching your mouse and give you faster windows 10 experience. All you need to do is, simultaneously press Windows key + I. So, these were our top 7 tips and tricks for Windows 10 users. Let us know, if you know some other tricks and tweaks, you can leave your comments in the below comments section.